I’m making a very important point. But there are days that are BESTEST than others. (My Grammar teacher in grade school is rolling in her grave right now.) And this month is one of those BESTEST days. Why? Because the Stock Market is down. You see, in the past four months, we saw the Stock Market go up like a turbo rocket. It went berserk. But now, it MUST go down before it goes up again. That’s just its cyclic nature. That’s why—if you haven’t started investing in the Stock Market, get into it NOW. By the way, my letter today isn’t for everyone. Please disregard if this isn’t your concern. I don’t expect everyone to join my TrulyRichClub. If this isn’t for you, I apologize for bothering you with this letter. 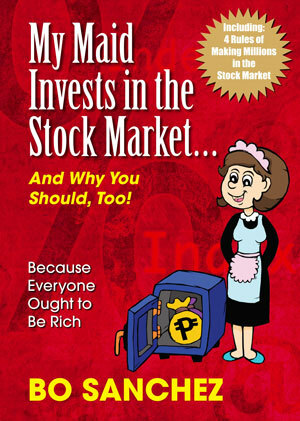 Because today,I’m specifically writing to people who want to grow their financial life—and who want my guidance in investing in the Stock Market. Are you tired of being stuck in a rut in your finances? Are you tired of your lingering debts? Are you tired of feeling the pain of wanting to help people you love, but can’t, because you don’t have the resources? Are you tired of your big fears and uncertainty? Are you tired of working very hard everyday, only to realize that you don’t really have any savings for your future? Just in case you’re that person, let me help you.